(a) How high a hill can a car coast up (engine disengaged) if work done by friction is negligible and its initial speed is 110 km/h? (b) If, in actuality, a 750-kg car with an initial speed of 110 km/h is observed to coast up a hill to a height 22.0 m above its starting point, how much thermal energy was generated by friction? (c) What is the average force of friction if the hill has a slope $2.5^\circ$ above the horizontal? This is College Physics Answers with Shaun Dychko. The change in potential energy of a system is the opposite of the change in its kinetic energy. So the system here is this car and earth system and the car is going to go up a hill, and so its change in potential energy will be positive mgh because it's going to have some -- it's going to gain some potential energy as it goes up this height h. It will lose some kinetic energy and the change in kinetic energy is going to be one half times its mass times its final speed squared, minus one half times mass times its initial speed squared. But its final speed is zero. So this negative and this negative make positive one half m vi squared. So we can divide both sides by mg to solve for the maximum possible height that this car can reach while coasting. That will be the initial speed squared divided by two g. So we have 110 kilometers per hour converted into meters per second by multiplying by 1000 meters per kilometer and then by one hour for every 3600 seconds, giving us meters per second. We square that result, divide by two and divide by 9.8 meters per second squared. This gives 47.6 meters is the maximum height the car could coast to given this initial speed. The next question is assuming that it reaches only 22 meters in height and so it's reached a height less than the theoretical maximum, what must have been the amount of energy lost to friction? Well, the final in kinetic and potential energies equal the total initial and potential energy plus this work done by a non-conservative force which friction is, a non-conservative force. 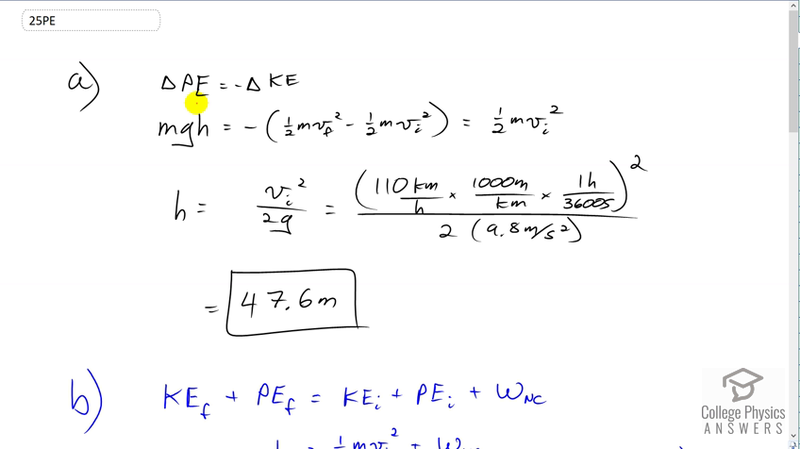 So we're going to solve for this and we also know there is no final kinetic energy, there's no initial potential energy because we'll take the initial height of the car to be our reference level, h equals zero. So we have mgh final potential energy, is one half m vi squared plus the work done by this non-conservative force. We can solve for that by subtracting one half m vi squared from both sides. We get the non-conservative force work is mgh minus one m vi squared, and I factored out the m just to make this look a bit cleaner. So we have 750 kilograms times 9.8 meters per second squared times 22 meters, minus 110 kilometers per hour converted into meters per second by dividing by 3.6 -- that's just a shorthand way of all this here, by the way -- and square that, divide by two, and we get negative 1.88 times ten to the five joules. We expected a negative sign here because we know that the direction of the friction force is opposing the direction of the displacement of the car. So when you have the force and displacement anti-parallel, then the work done by that force will be negative. We also expected the negative because we know that the total final energy, mechanical energy, of the system will be less than the total initial mechanical energy. So we expected this thing to be negative in order to reduce the sum of the initial kinetic and potential energies. So the energy lost to friction is the magnitude of the work done by the friction and so that's 1.888 times ten to the five joules. Then given that the hill is inclined at an angle of 2.5 degrees, what would the friction force have been in Newtons? Well, we know the work done by this non-conservative force is the friction force multiplied by the displacement. The displacement is the displacement along the ramp because we want to find the component of displacement parallel to the force. We know that the force is certainly along the ramp. If we were to draw the car it would be like this. Well, with a wheel there and another wheel there and then the friction force would be like this down along the ramp and its velocity is up along the ramp. So the component of this height that is along the ramp is the length of this hypotenuse. We know the height is the opposite leg of this triangle and so the hypotenuse multiplied by sine theta gives us that height and we can solve this for d which is what we want to plug in here by dividing both sides by sine theta and then switching the sides around. That gives us d equals h over sine theta. So we substitute that in for d. So the friction force after we solve this for friction force by multiplying both sides by sine theta over h, is the work done by friction times sine theta over h. So that's negative 1.888 times ten to the five joules times sine of 2.5 degrees divided by 22 meters, giving us negative 373 Newtons. The negative sign just means that the friction force has a direction opposite to the displacement.